Amaircare XR100 Auto Air Purifier is a compact Amaircare air purifier that offers an effective air quality solutions in cars, trucks, RVs, boats. 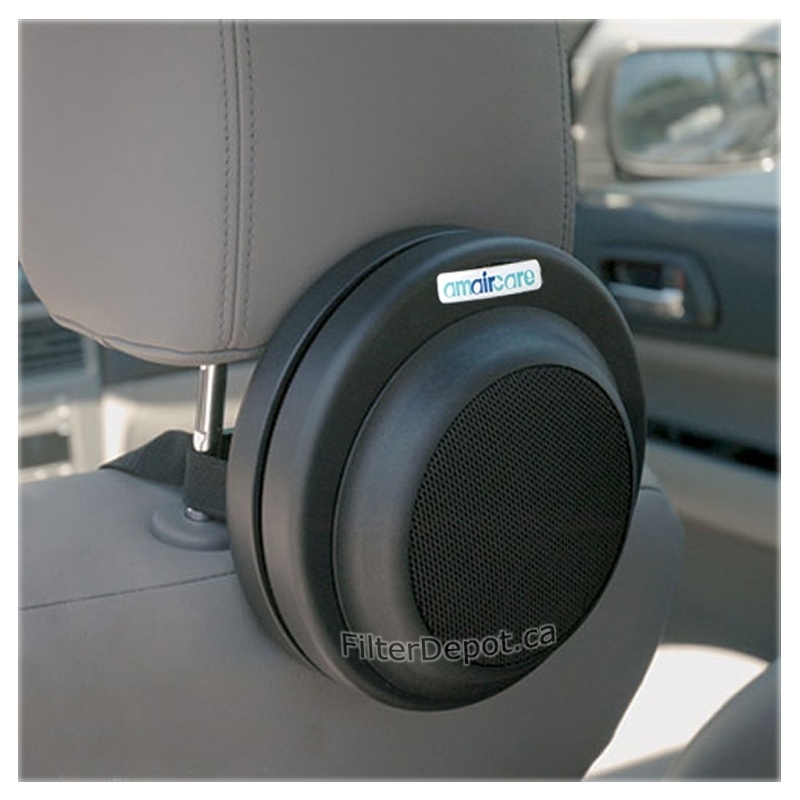 Amaircare XR100 Auto Air Purifier is a compact, easy-to-install, lightweight Amaircare air purifier designed to help combat the air pollution in cars, trucks, RVs, boats and other small areas up to 75 sq. ft. When to Use Amaircare XR100 Air Purifier? Amaircare XR100 Auto Air Purifier effectively adsorbs exhaust fumes and gases, fuel fumes, stale odors, cigarette smoke and traps dust and dirt particles, dust mites and debris, pet dander, etc. This makes Amaircare XR100 highly beneficial for individuals whose daily activities involve a long commute in a heavy traffic of metropolitan areas. Amaircare XR100 air purifier is a lightweight, compact, quiet and energy efficient air purifier which is easy to bring along and run from virtually all power sources, including 12V DC or 120-240 V AC (with power adaptor). 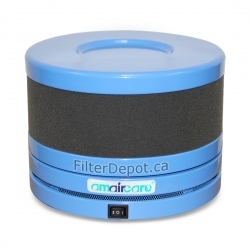 Amaircare XR100 Auto Air Purifier is equipped with a single three-stage particle and chemical filter cartridge (a set of 3 filter cartridges shown). - Zeolite (VOC) filter (bottom layer). 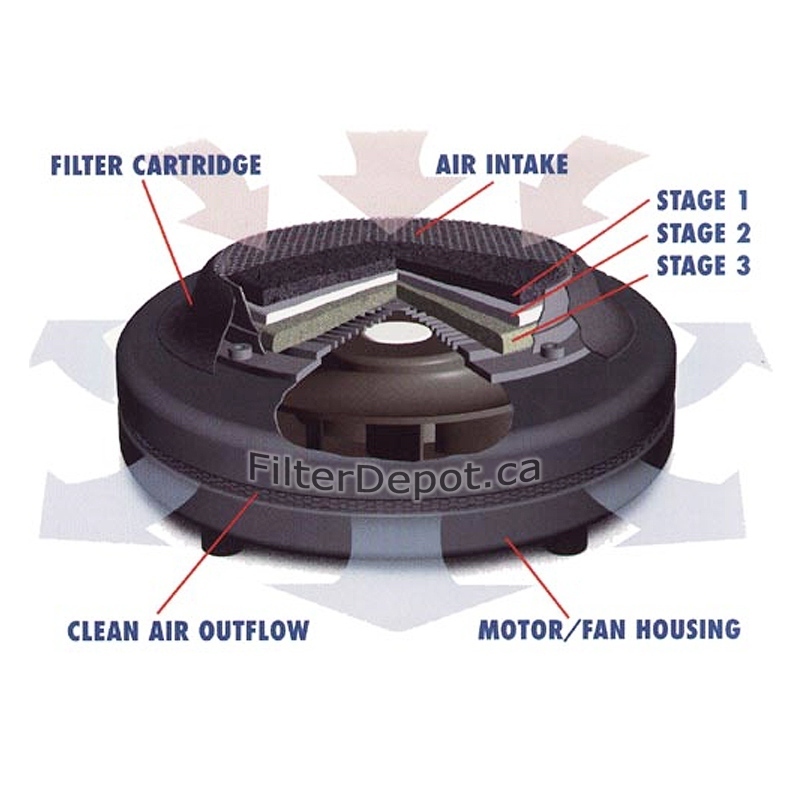 The snap-on filter cartridge design allows conveniently and easily replace all three filters simultaneously. Dust carbon filter effectively adsorbs chemicals and noxious odors such as: exhaust gases, fuel fumes, stale odors, pet odors, cigarette smoke, etc. 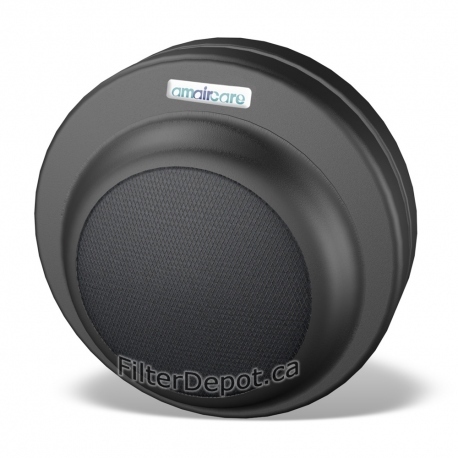 Amaircare XR100 electret filter effectively traps most microscopic allergens and dust. The Electret filter media is an electrostatically charged cloth. It has a property of attracting and trapping microscopic airborne contaminants such as: lung damaging dust, pet dander, mold sores, dust mites and debris, pollen, plant spores, germs, etc. Zeolite filter (layer) helps improve the ability of Amaircare XR100 to trap VOCs and toxic off-gassing from new vehicle, exhaust gases and fuel fumes from the traffic. Amaircare XR100 Auto air purifier is powered by Energy efficient and quiet 12V DC (direct current) electric motor with centrifugal fan. The power consumption is only 5 Watts. The electric motor is rated for a long continuous operation and a long lifetime, and is run tested for 35,000 hours of continuous operation. The motor has a single Fan speed rated at 20 CFM. It delivers and optional air flow and sufficient air purifier performance for areas up 75 sq. ft. The level of noise is below 30 dB. Amaircare XR100 Auto air purifier features the compact, lightweight (only 2.1 lbs. ), durable impact resistant the all steel housing design. The motor housing is made of 24 gauge cold rolled steel with non off-gassing appliance quality baked-on powder coating. Available in Black Sandext color only. 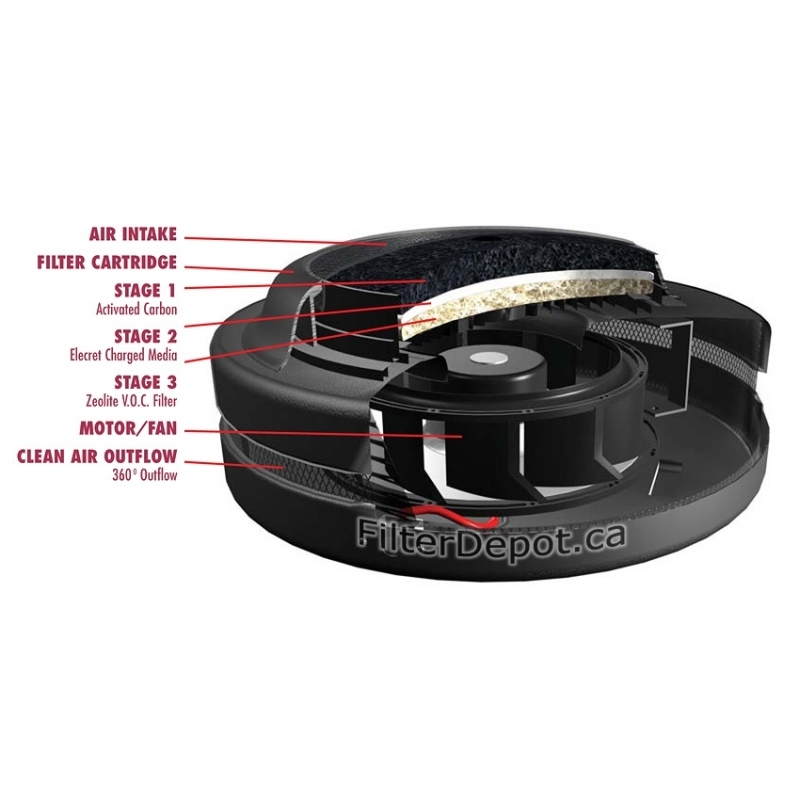 Amaircare XR100 features a large polluted air intake at the top of the unit, which holds the air filter cartridge. The XR100's 360° clean air outlet located at the lower section of the unit, ensures an even distribution of clean air and improves the air purifier performance. Amaircare XR100 has a space saving design. The unit can be strapped conveniently and securely to the back of the car seat's headrest or to other suitable object in the vehicle. 5 Years on Motor / Fan assembly. 1 Year on All other parts (filters excluded). With full set of Filters installed. 12V DC power adaptor and car seat strap included. Ready-to-Use (unpack and plug it in). Amaircare XR100 air purifiers ship free of charge by UPS or FedEx Ground delivery services in Canada and the Continental USA. Other faster delivery services are available at a cost (will be displayed in the shopping cart). There are no additional charges or extra fees related to the border crossing (if needed) for all US and Canadian customers. If the unit is found Damaged or Defective upon arrival, it will be promptly replaced with new one Free of charge.